A pupil. A teacher. A mother's worst nightmare. From the winner of the 2014 Good Housekeeping novel writing competition, The Daughter’s Secret shone out from thousands of entries. I have worked as a copywriter for years but only started writing fiction in 2012. The Daughter’s Secret (released by Orion on 13th August) is my first published novel. I hope there will be more to come. What is it about your genre that appeals to you the most? Do you read other genres? What appeals to me about psychological thrillers is the opportunity as a reader and a writer to explore the intricacies of relationships and family dynamics. There is nothing more terrifying to me than the idea that those we love and trust are the people who can do us the most harm and it is exactly this fear that psychological thrillers can explore. I read very widely and would hate to restrict myself to one genre. At the moment I am reading a lot of crime fiction, but my to be read pile covers everything from crime to literary fiction to young adult and science fiction. Margaret Atwood is one of my favourite authors and one of the things I love most about her novels is the way they span genres. 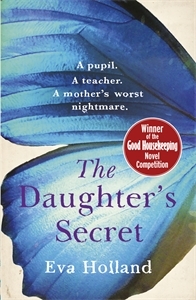 The Daughter’s Secret is a psychological thriller that follows eleven days in the life of Rosalind Simm. Rosalind lived a normal life with her husband and two children until her fifteen-year-old daughter’s shocking disappearance with teacher Nathan Temperley propelled the family into the public eye. Six years later, Rosalind discovers that Temperley is about to be released from prison. As she grapples with the shadow his early release casts over her family, Rosalind must face the way the events of the past have shaped their lives. I read a lot of newspapers and am always drawn to stories about families in extreme circumstances, especially ‘normal’ families who suddenly find themselves on the front pages due to a twist of fate or the actions of others. I am fascinated by the question of what happens next: how do these families recover and are they ever ‘normal’ again? In my novel I wanted to return to the scene of a crime and discover how a mother has coped with her daughter’s scandalous relationship with a teacher, how much this has shaped their lives and the extent to which she blames herself and others for what happened. Assuming she can do a British accent – she’s a fantastic actor and I’m sure she can – Julianne Moore would make a brilliant Rosalind Simm. I would cast Jamie Dornan as the teacher, Nathan Temperley. He was amazing in The Fall and combines his boyish good looks with the capacity to be deeply sinister. Jane Eyre by Charlotte Brontë. I know not everyone will agree but I though the 2011 film directed by Cary Fukunaga and starring Mia Wasikowska, Michael Fassbender and Judi Dench was a marvellous adaptation. I went into the cinema full of doubts but emerged in tears at the moving portrayal of Jane and Mr Rochester. I have just finished reading Burial Rites by Hannah Kent. It is the story of a woman condemned to be executed for murder in rural Iceland in 1829. It is fantastically atmospheric and I would definitely recommend it, especially to fans of crime and historical fiction. I have a desk in my spare room where I write every morning. I try to get out of the house in the afternoons and often spend a couple of hours writing in a coffee shop or the café at my gym. My dream writing location would be overlooking the beach in Thurlestone on the South Devon Coast. My grandparents lived there and I spent a lot of time there as a child. It is incredibly beautiful and unspoilt. The first short story I wrote as an adult was about a man scouring a post-apocalyptic landscape for reels of dental floss. I live very close to Alexandra Palace in North London, which is where the first ever BBC television broadcast took place. The original mast and studios are still there and it’s a great place to visit. I’m inspired by the gaps in people’s stories – the distance between how they present themselves to the outside world and the reality of how they see themselves. I think reading is the closest we can ever come to being inside someone else’s head and I want my writing to explore our innermost thoughts and fears. I don’t have a muse as such, but I do have an enquiring mind and an overactive imagination. That is a tough question. It would need to be someone who could convey my inner turmoil while doing nothing but tap away on a laptop and drink coffee! I think Anna Friel would do an excellent job. I am working full speed ahead on the first draft of a second novel at the moment. It is a psychological thriller with a dark mystery at its heart. The words are tumbling out and I am very excited about finishing it. One day I will adopt a dog from Battersea Dogs and Cats Home. I love dogs and hope to be able to give one a home someday. A dog who likes plenty of company and a lazy morning followed by a good long walk in the afternoon would be very happy in my home. I write in silence. I envy people who can listen to music while they write, but I find it interferes with the rhythm of the words. Animal Nitrate by Suede. I am fourteen years old again as soon as I hear the opening chord. Eva Holland is a thirty-four year old freelance copywriter and public relations consultant with a lifelong love of words and stories. She grew up in Gloucestershire and studied in Leeds before moving to London where she lives with her husband. The Daughter’s Secret is her first novel.